Take either of two roads from Occidental to the coast. Less than an hour north of San Francisco is some of the best bicycle riding in Northern California. You can travel flower-lined country roads that pass organic farms, ride under towering redwoods or pedal down quaint lanes past vineyards and wineries. You can also try winding routes that follow the gentle Russian River to the wild Pacific coastline. The area is synonymous with good riding. With 2,250 kilometers/1,400 miles of lightly traveled secondary roads and a growing system of off-road bike trails, Sonoma County appeals to a wide variety of riders. Whether you are a dedicated cyclist attacking mountain passes or a weekend pedaler eager to sip wine and cycle through the vines, Sonoma County can provide you the perfect track. It's no wonder Bicycling Magazine listed the area as one of "The 7 Greatest Rides on Earth." An avid cycling community is here. Perhaps the most notable is star resident and professional cyclist Levi Leipheimer. Serious bicyclists come to train as well as to compete. Sonoma County was at the starting line (and Stage 1 finish) for the Amgen Tour of California, May 13. Two challenging rides in the county are the Kings Ridge-Tin Barn Road near Cazadero and Coleman Valley Road near Occidental. The Kings Ridge ride, favored by pro racer Levi Leipheimer, is a challenging, hilly course. It is considered one of the most beautiful, fulfilling bike rides in the world. The Coleman Valley ride is a landmark climb in Northern California and was featured in this year's Amgen Tour of California. The Sonoma Coast 60-kilometer/40-mile ride is best done in the early morning before the motorists hit Highway One. It includes a couple of challenging hills. A good starting place is the town of Occidental through Monte Rio and Duncans Mills along Highway 116 to the fishing village of Bodega Bay. The Geysers 80-kilometer/50-mile loop (1,000 meters/3,500 feet of climb) is very remote, with no services and very challenging terrain between Geyserville and Cloverdale. Suitable for fit, experienced riders only. 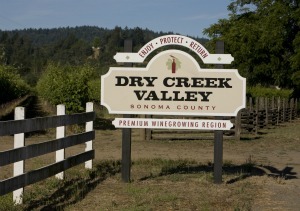 Come for one of the popular wine-tasting rides, known as "sip Pastoral Dry Creek Valley offers tranquil riding. Photo by George Roseand cycle," where you can stop along the way every mile or so to taste wines at one of the more than 300 wineries. There are ideal places along the way to linger with a picnic of fresh wine country produce, breads, pasta, olive oil, fruit, cheese and chocolates. The West Dry Creek Road near Healdsburg is a picturesque ride with a few rolling hills through vineyards and country roads. Many of the wineries are only minutes apart. Another great route is Red Winery Road in the Alexander Valley between Healdsburg and Geyserville. 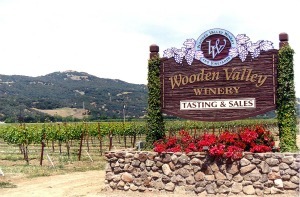 This is a quiet, peaceful, flat and virtually traffic free area with beautiful oak dotted hills and miles of vineyards. Explore the many paths as you pedal through Armstrong Redwoods under the giant trees in a truly tranquil and peaceful setting. The Joe Rodota Trail, a segment of the West County Trail, is paved and runs between Santa Rosa and Sebastopol. It's built on an former railroad right-of-way; several bridges have been constructed over the old trestles. The trail is especially popular in the spring with the vivid blooming of the wildflowers. It is an excellent place for bird watching year-round. The West County Trail between the towns of Sebastopol and Forestville is a paved path and relatively flat with a few gentle climbs. An unpaved horseback riding trail runs parallel. The West County Trail and the Joe Rodota Trail offer beautiful farm and agricultural views. 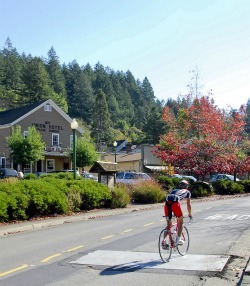 The leisurely 32-kilometer/20-mile Sonoma Valley ride explores the scenic Valley of the Moon. Begin at the Sonoma Plaza, ride past the historic General Vallejo home and continue on back roads through the town of Glen Ellen to the Jack London State Historic Park. The winding roads and gentle climbs allow you to soak in the beautiful views of lush greenery, vineyards, streams and oak trees. Starting and ending in Petaluma, the 48-kilometer/30-mile Spring Hill-Chileno Valley ride is a pleasant tour of the dairy lands along the border between Sonoma and Marin Counties. Much of this trail is on quiet back roads and is very scenic; some sections offer moderate to fairly serious climbs. Bike rentals or guided personalized tours; gourmet lunches available. Located just blocks away from excellent riding sites - Spring Lake Park, Howarth Park and Annadel Park. Staff will help you find the right bike and the right trail or road to ride on. The coalition also has a bicycle map online, or available for purchase a printed map. Excellent site for group events and rides. Editor's note: Links to the websites of hundreds of Sonoma County lodging and dining options can be found at Taste California Travel's Resource Directory. Napa and Sonoma may get all the press, and the Gold Country may have all of that rugged history, but the wine country of California’s Central Valley has its story too. Rightly famous for its rich soils and temperate climate, the Central Valley can produce wines of character that, when compared to some of those other regions, are a great value. You may not be familiar with some of these California wine regions, but they're definitely worth investigating. Known for its warm days and mild Delta breezes, the wine country of Yolo County yields unforgettable wines of great character and diversity. Here you’ll find outstanding Syrah, Chardonnay, Zinfandel, Tempranillo and Cabernet Souvignon, but also lesser-grown varietals such as Viognier, Malbec, Primitivo, and Albarino, plus Sparkling and Port. You’re sure to find something memorable, and affordable, to suit your taste. Virtually all of Yolo County's some two-dozen wineries are family owned and operated—including major producer Bogle Vineyards in the Clarksburg AVA—making for a more intimate experience for visitors. In the little town of Winters you can sample wines at the tasting rooms of Berryessa Gap and Turkovich Family Wines (also home to the Winters Cheese Company, which offers samples, as well). In Clarksburg, the Old Sugar Mill is a unique, historic venue, housing six tasting rooms representing eight wineries all under one roof! From Clarksburg to Davis, Winters to verdant Capay Valley and Dunnigan Hills, you’ll also enjoy gorgeous scenery, great dining opportunities, and comfortable, welcoming places to stay. For more information about Yolo County wineries and other attractions, visit www.yolocvb.org. Suisun Valley is rustic wine country, nestled in the unspoiled Solano County farmland between San Francisco and Sacramento. The Suisun Valley appellation was established in 1982, and is nestled between two coastal mountain ranges, southeast of Napa Valley. In this diverse agricultural region are approximately 10 wineries, whose vineyards grow 23 different wine grape varieties. They are best known for their Petite Sirah, Merlot and Cabernet Sauvignon. If you fancy Bordeaux, Burgundy, and Rhone varietals, you must visit Ledgewood Creek, a winery named after the creek that meanders along the northern border of this estate. For lesser known varietals—such as a Malvasia Bianca made in a late harvest style—visit Blacksmith Cellars. And for a rugged, natural experience try Winterhawk Winery, which has placed owl houses and hawk boxes strategically throughout the vineyard, beckoning a wide variety of birds including Red-Tailed Hawks, Swainson’s Hawks, Sparrow Hawks, and Northern Harriers. Besides the wineries, visitors will encounter many farm stands, selling fruits and vegetables, dried fruits, nuts and freshly produced olive oils, from family farms that have been handed down for generations. There are also regular, seasonal events that are fun and laid-back. For more information about Suisun Valley wineries, visit www.suisunvalley.com. Though Lodi has produced wine for well over a hundred years, quality has soared in recent years. Growers have made commitment to the best viticultural practices and they've planted many new varieties to complement the Zinfandel which has always done well here. Located directly east of San Francisco at the edge of the Sacramento River Delta, the Lodi appellation (which has seven sub-appellations) is noted for its classic Mediterranean climate and its distinctive sandy soils. Today you can choose from nearly 80 wineries that call Lodi home, an abundance that’s impossible to bypass. Lodi is the self-proclaimed Zinfandel Capital of the World, producing more than 40 percent of California’s premium Zinfandel. Many of the region’s most distinctive wines come from the thousands of acres of “old vines”, some dating back to the 1880s. Styles range from medium to full-bodied with intense red and black fruit flavors of cherries, raspberries, and blackberries. Lodi is predominately a red wine producer with approximately 66 percent of the acreage dedicated to red varieties. For many years it was California’s best kept secret, enhancing the fruit in many of the state’s most popular premium varietal wines. Zinfandel, Cabernet Sauvignon, Merlot, and Chardonnay account for the lion’s share of the acreage; however with more 60 varieties in commercial production Lodi offers a vast portfolio of exciting wines. No visit would be complete without a stop at the Lodi Wine & Visitor Center. Here guests can taste from more than 200 Lodi wines and marvel at the hands-on demonstration vineyard. 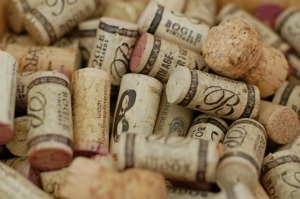 For more information about Lodi wines, visit www.lodiwine.com. In the heart of the Central Valley, and a gateway to Yosemite National Park, Fresno is a surprisingly good destination for wine tasting in rambling Madera County. Nearly 20 wineries are open to visitors here, with vintners who are passionate about making the best wines possible. Cabernet Sauvignon, Syrah, Merlot, and Chardonnay are the leaders here, but visitors will also find excellent Tempranillo, Albarino, Sangiovese, and Barbera, plus delightful late harvest Zinfandel and luscious ports. Quality is paramount for these largely boutique wineries. For example, Engelmann Cellars focuses on creating hand-crafted reds and blends. Third-generation Ficklin Vineyards specializes in ports, including their lineup of flavored “Passport” wines. Nonini Winery, a fourth-generation family operation established in 1936, has 15 varieties of premium wines and offers a tour of the winery starting with the 1941 Garolla grape crusher from Italy and ends with the finished product resting in redwood tanks/oak barrels. Two venues give visitors a chance to try several wines at once. Vino & Friends is a downtown Fresno wine store with a changing tasting menu. Also, be sure to stop by Appellation: California Wine Tasting & Visitor Center, which pours products from family owned wineries or vineyards of the Central Valley. The Center also offers wine education classes. For more information about Fresno wineries and other activities in and around town, visit www.playfresno.org. Editor's note: Planning a visit to any of the areas mentioned in this article? You'll find links to hundreds of lodging and dining options in Taste California Travel's Resource Directory. 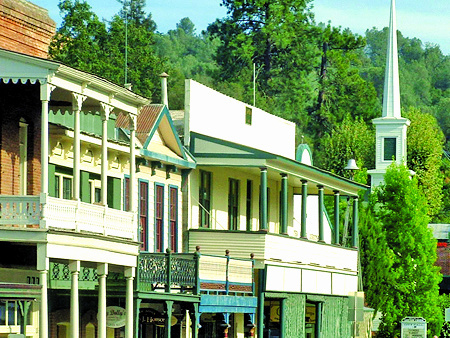 The northeast/central California region known as the Gold Country, an area made up of 12 counties and dozens of historic towns dotting Highway 49 has been named one of the top ten U.S. travel destinations to see in 2012 by Lonely Planet. Sutter Creek has old west flavor. Known for their annual travel list for international destinations and their compilation of U.S. picks for the last two years, Lonely Planet's U.S. travel editors carved out a list of what's new, interesting, and in some cases likely to be overlooked by travelers. The full list is on www.lonelyplanet.com, the company's web site with more than 10 million unique visitors monthly. The Gold Country, ranked number six is listed as a closer, less expensive and less crowded option than Lake Tahoe and Yosemite from San Francisco. With Sacramento as its anchor, the area stretches from north of Lake Tahoe to south of Yosemite National Park's border towns. The editors' description of "towns oozing with century-old ambience strung out like throw-back pearls along Highway 49" reveals Lonely Planet's authentic editorial approach. The list points to the artsy towns as good overnight choices and mentions the growing wine region as a contender to Napa and Sonoma. Historically known for the infamous cry of "Eureka!" and the 1949 California Gold Rush, the Gold Country region offers an abundant collection of outdoor adventures; hiking and biking, gemstone mining, exploring caverns, steam trains, historic sites, endurance competitions and triathlons, frog jumping and street fairs, and of course, panning for gold, although the quest has shifted from gold mining sifting pans to swirling golden wine a glass. The Gold Country region is home to more than 175 wineries, many with visitor center tasting rooms and the chance to walk the vineyard with the winemaker. Lodging choices range from hostelries on Main Streets and country cottages and inns to luxury hotels in Sacramento, the state capital. Maps, directions, activities and accommodations information is at www.calgold.org. Editor's note: Links to the websites of hundreds of Gold Country lodging and dining options can be found at Taste California Travel's Resource Directory.